When the multi-award-winning nature photographer Brutus Östling points his camera at Africa’s big game animals he creates magical pictures. 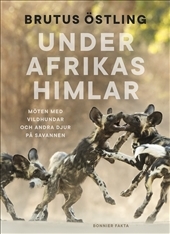 This book shows us the African savannah as we have never seen it before, with photographs that are guaranteed to captivate you. But it is also a book that helps you understand nature’s complex interaction and that allows you to meet species that only a few have succeeded in portraying. Under the Skies of Africa takes us as close to the African savannah as it is possible to get without actually going there. A spectacular safari in the form of a book.